Front Row Fashion Show Seats? What? Hey guys! Sorry I’ve been a little MIA lately…but maybe it’s because…I’m in the middle of planning a fashion show! If you have not already heard, StreetStyleChi is putting on a fashion show with major Chicago designers on March 9th. We are in crunch time for the show. Joseph and I have been running around having meetings all over the city, getting swag bag donations, and now we’re starting to pick up looks for the show. 100% of the proceeds from this event (it’s free to attend, but a little money donated to the charities would be nice!) will be benefiting UNICEF and PANGEA Education Development. Grab your friends, throw on some fun dresses, and we will see you there! A more detailed post on the event will be out soon, so stay tuned! Also, we are having an Instagram contest in order to win front row seats to the show, as well as a little extra swag for you and a friend. It’s super simple to enter! 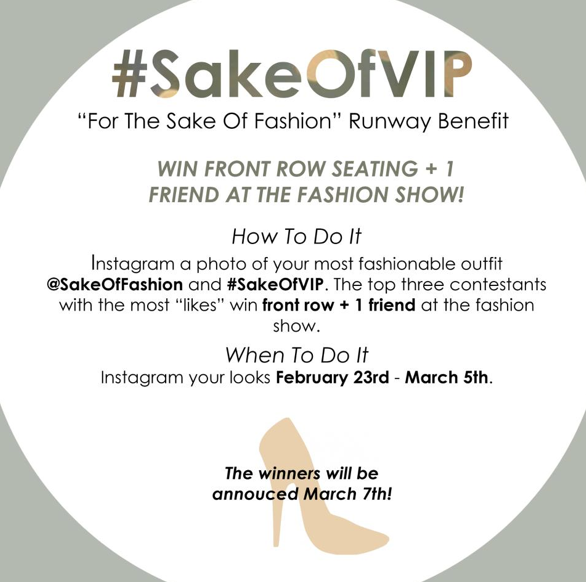 Instagram a picture of your favorite fashionable outfit to @SakeofFashion and #SakeofVIP The top three contestants with the most likes win front row + a friend at the fashion show, and some extra swag. The contest is open February 23rd to March 5th, so get going.